Advice columns have been one of the mainstays of newspapers since the 20th century. Writers such as Ann Landers, Dear Abby, and Dr. Joyce Brothers are well known today as newspaper columnists that doled out advice on everything including love, etiquette, and family relationships. But where did this idea come from to write your most burning questions to a stranger working for a newspaper? Especially when those questions concerned private matters like falling in love, whom to marry, or when to file for a divorce? 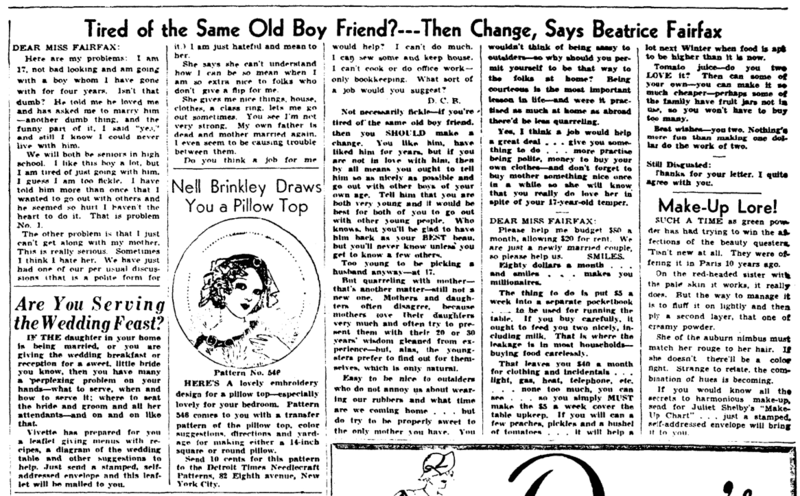 From 1898 to the 1960s, Gasch, along with a few other writers, would answer these letters in the syndicated column “Advice to the Lovelorn.” Fairfax answered queries from readers both male and female, young and old, who wrote about their love dilemmas. “All young men and women have love affairs. At such times they need advice. Often it is impossible to obtain it from their families. Families are notoriously unsympathetic in such cases. 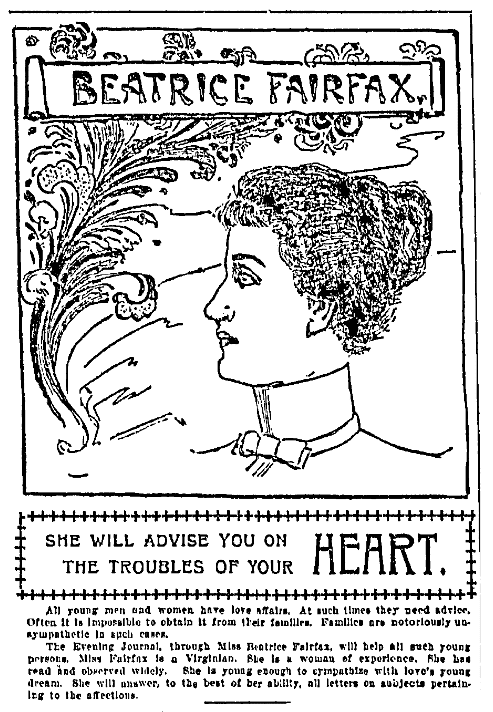 Here is the very first advice column, published by the New York Evening Journal on 20 July 1898. Over time, the look of the column changed – but the advice remained consistent and strong. Here is another column, published just 12 days after the original. However, despite the column’s title, not all of the advice given by Fairfax was about love. Take this 1910 question for example, which is about prevailing etiquette. 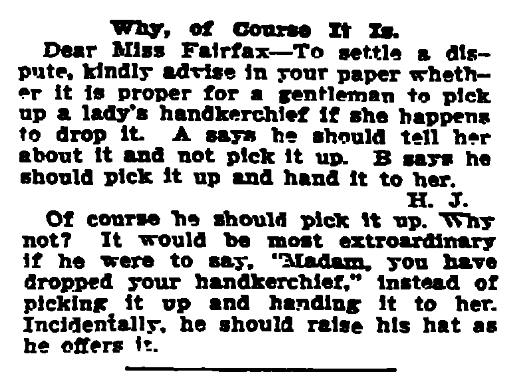 The writer asks whether a gentleman should pick up a handkerchief that a lady has dropped. 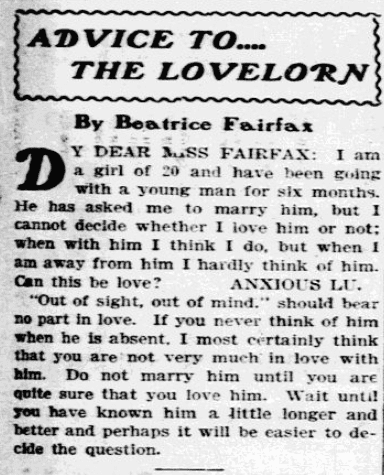 This 1920 “Advice to the Lovelorn” column involves friendships with married men and those between a bachelor and a married woman. The first letter, from a reader who is friends with a much older married man, has Fairfax warning that she is just inviting unhappiness. The writer also asked if she should get a job, which Fairfax answers with the suggestion that she not only get that job but buy something nice for her mother. 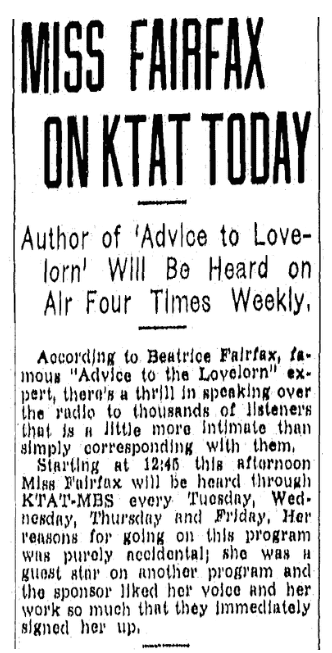 Fairfax’s popularity extended beyond the newspaper pages and included a 1930s radio program that provided her another forum in which to answer the public’s questions. 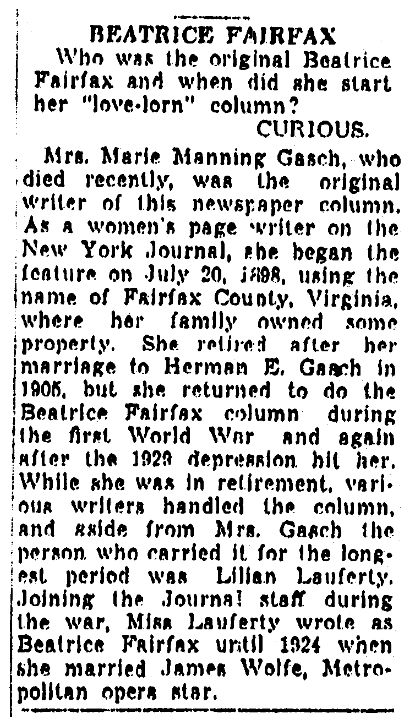 “Beatrice Fairfax” continued to answer questions after the originator of the column, Marie Manning Gasch, passed away in 1945. But Fairfax’s popularity was much bigger than her originator. 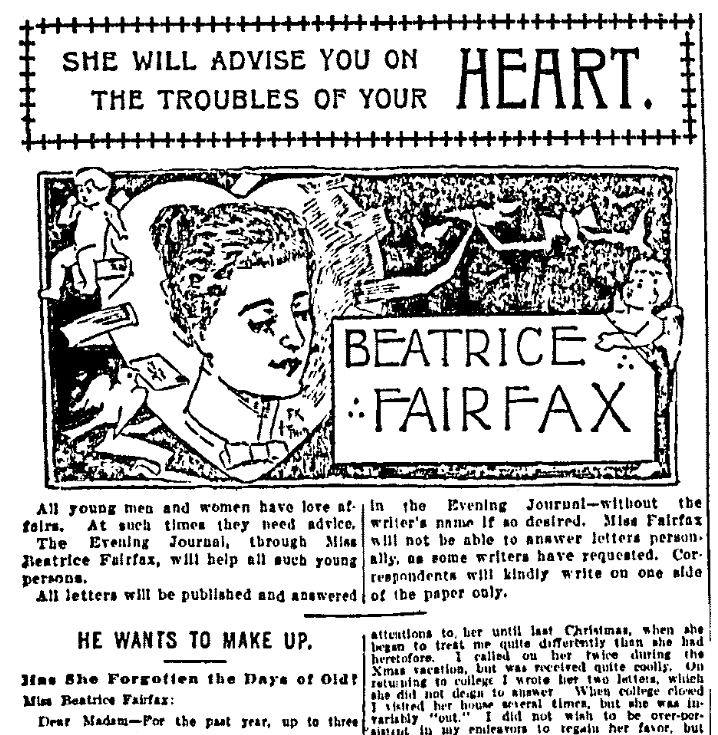 Fairfax was a celebrity for some of the same reasons other fictitious women – for example, Betty Crocker – were. She provided answers to an inquisitive public. Fairfax’s legacy can be found in the advice columns that pepper newspapers today, and the readers who continue to ask questions in anonymity. * “The Original Dear Abby,” Mental Floss (http://mentalfloss.com/article/33542/marie-manning-original-dear-abby: accessed 29 December 2018). February Update: GenealogyBank Just Added New Content from 59 Titles!